40 minutes away from Tours, in the heart of the western Loire Valley, near the picture-perfect town of Chinon. 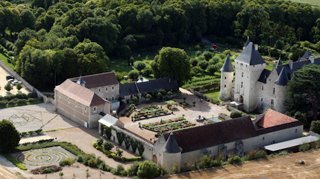 The Chateau du Rivau is an extraordinarily beautiful and historically significant private chateau. Lovingly performed by its owners, the restoration of the chateau has received the best grand Prize awacs. Le Rivau is a unique architectural ensemble gathering a medievalfortress, Renaissance stables and a winery that were immortalized by Joan of Arc and Rabelais. The gardens of le Rivau were inspired by myths and legends, and are farytale gardens. Prestigious receptions in the barn of la Toison d'Or can be organised and entirely illuminated by candles. The service can be provided by waiters in medieval garments. Dining for up to 500 people, of which 200 may be seated in the contiguous winery. The excellent acoustic allows brillant parties.